At the moment, nothing is airing on Taranga FM; the office is dark. Power has been cut for 48 hours and even the generator has stopped working. This popular community radio in the outskirts of Gambia's capital, Banjul, is used to challenges. Its troubles started in 2008, when Taranga FM began broadcasting local press reviews in the Wolof, Mandinka and Fula languages. "We are the first radio station in The Gambia to make sure that we review all newspapers irrespective of their ideology," said Biram S. Jobe, the station's assistant director. "We take news that is very important to the public and interpret it in a local language so the community will be able to understand." Gambia's president at that time, Yahya Jammeh, did not appreciate independent news coverage — particularly not in a language understood by the majority of the population. He considered Taranga FM a threat to national security, and his government shut down the station five times. Since Jammeh fled to Equatorial Guinea in January, after refusing to concede defeat in December's presidential election, things are looking up. The new government has vowed to restore press freedom, and the Public Utilities Regulatory Authorities, or PURA, is currently processing 30 applications for new radio stations. Among the existing broadcasters, many are now producing shows in local languages. Radio Star FM recently launched a show which reviews politics and current affairs in Mandinka. Presenter Ousman Trawallay said such a show would have been impossible under the former regime, "because Jammeh restricted the media and personnel discussing his affairs." The new government has been reaching out to journalists. Since his appointment in February, Minister of Information Demba Ali Jawo has visited newspaper offices and sent his contact details to online media platforms, and is planning a meeting with all radio station owners before the end of this month. 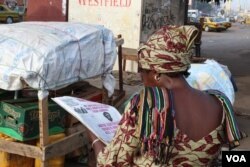 A newspaper vendor is seen in Westfield, Banjul, Gambia, June 7, 2017. "Now I can pick [up] a phone and call somebody at the Ministry of Information," said Talibeh Hydara, the assistant editor of The Standard newspaper. "The person might not be able to give me all that I want, but at least it's a difference. A big difference from before. Then you dare not." These changes in reporting have been positive for the newspaper industry. The production manager of The Standard, Yusupha Saho, said the paper recently doubled the number of copies it distributed to street vendors to meet growing demand. 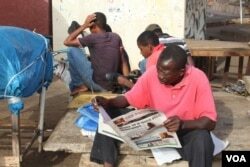 At a local newsstand in Banjul, vendors also said their sales had increased. 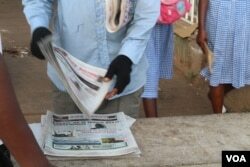 Many Gambians, such as George Jesuorobo, have started buying a selection of daily papers. "Before, I hardly buy papers," he said, clutching copies of The Point, Daily Observer, The Standard and The Voice. "I believed that what is going to be reported is what [is] already planned ahead. But this time, I buy papers because the government is not interfering." The scene is changing, but rights groups and journalists say there is still a way to go. During his time in office, Jammeh stifled freedom of expression by implementing laws on sedition, defamation and the publication of so-called "false news." These measures remain in place and the Gambia Press Union, or GPU, has been pushing for reforms. GPU Secretary General Saikou Jammeh said the government had been receptive to the proposals, but slow to act. It will also take time for journalists to fully trust the authorities. The global rights organization Article 19 says harassment, arbitrary arrest and torture under Jammeh forced more than 100 Gambian journalists to flee the country. The new government has taken steps to address impunity. In May, the Banjul Magistrates Court issued arrest warrants for two former soldiers suspected of murdering Deyda Hydara, an editor of The Point, who was found shot dead in his car in 2004. The case of another local reporter, Ebrima Manneh of the Daily Observer, remains unsolved. He went missing in 2006. This month in Banjul, Article 19 and UNESCO held a training for Gambian security forces on freedom of expression and journalist safety. For the first time, reporters sat at the same table as the officials they feared in the past. Seyni Marenah is a Gambian journalist who recently returned to the country after living in exile for three years. He took part in the training, where he encountered his former prosecutor. For Marenah, this is an important step forward, but not enough for journalists to feel entirely safe. "Still they have this mentality that they are securities and they will not talk to the media," he said. "There are people in this system that still believe that journalists are enemies, and this is something that really needs to change."